You know what goes well with Tuesdays? Italian. More specifically, a refreshing, upscale take on traditional Italian dishes. 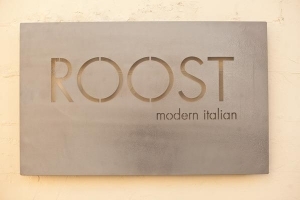 And I can tell you the perfect place to get just that—Roost Modern Italian, a brand new restaurant opening today at 524 E. Fifth St. in the Oregon District. The owners, Dana Downs and Beth Hirschbach, had a dry run last Friday, and Dana was “beyond pleased it went so well.” This event allowed the owners to completely perfect the menu in time for their opening today. According to Dana, whom I had the pleasure of speaking with over the phone this afternoon, “you have to be a little crazy to open up a restaurant!” But this “crazy” duo seems to have a copy of the recipe for success; the ingredients consist of an original idea, a great location, and a lot of hard work and dedication. Dana and Beth started off this journey in the food industry in 2009, when they opened their own catering business, Veritas Foods. They decided to get their name out by using a booth at the Second Street Market, but unfortunately, no booths were available so they began selling frozen Italian food. Today, Black Rooster Pasta Bar consists of two booths at the Second Street Market, where they create a variety of pastas catered to the customers’ wishes. The next rung in the ladder consisted of opening their own restaurant. And thus, Roost Modern Italian was born on this Tuesday, the fifteenth of November. Roost? Yes, that’s correct. The rooster theme of both Black Rooster Pasta Bar and Roost Modern Italian originated from Dana’s love of Italian wine. On the foil of a bottle of Chianti Classico wine, the label includes a picture of a rooster. So from this spun the memorable and unique theme of a rooster in both eateries’ names. Why Italian, you may ask? Well, Dana spoke of having experience cooking Italian for years, but she and Beth aspired to create something unique—a modern twist on Italian. “The dishes go beyond traditional pasta and pizza,” explained Dana. Roost’s selection has been described as “refreshing” when referring to the new techniques and presentations of their cuisine. This eatery also offers an adult beverage list that was specifically selected to complement the food being served; this includes craft beers and high-class Italian wine. The owners specifically focused on featuring Italian wines connoisseurs will enjoy. And although this is considered a high-class restaurant, the prices are reasonable across the menu. experience must be superb as well. This is something Dana and Beth truly understand. 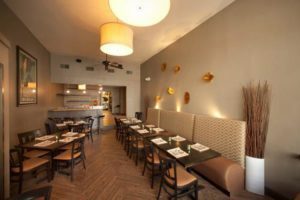 When I was speaking with Dana, she emphasized how Roost has a great location; the neighboring restaurant owners have been very supportive and welcoming, and Roost is in a great position to inherit a lot of foot traffic. The setting within the restaurant itself is very quaint, but “[felt] like big-city” to many attendees this past Friday. The energy within the space makes the dining area seem larger than it really is, while the inside eating scene is complemented by a great patio, which will eventually become the site of spring wine tastings. This ideal setting adds class and comfort to Roost Modern Italian, providing a great atmosphere for the enjoyment of great food. Lastly, the recipe for success could not be complete without a lot of dedication and hard work put in by the owners. Dana described opening a restaurant as “building a concept you need people to fall in love with. In the end, it’s all you. You receive tons of help, but you have to get it off the ground exactly the way you want it while on a budget.” Dana and Beth have put in many hours preparing for this day, and soon it will all be worth it. “You just have to trust your gut on things.” This piece of advice Dana has acquired from her success in the food industry thus far. It has brought Beth and her to this day, a completely different world than where they were just two years prior. Roost Modern Italian is officially open for business, providing a delicious modern take on Italian dishes, while also presenting a comfortable, high quality dining setting. Roost will be accepting a few reservations (so call in quick! ), while also providing catering services and gift certificates. So come join the festivities! Crack open a bottle of Italian wine and enjoy a dish, such as the Capesante in Crosta (Crusted Sea Scallops) or Arrosto alle Erbe T-Bone (Herb roasted T-Bone Steak). No matter your choice, you are sure to bite into a savory bit of unique Italian cuisine. And in the words of Porky the Pig—“Th-th-that’s all, folks!”…But only after dessert. I’ve got my eye on the Créme Brule del Giorno. Roost will be open Tues – Thurs for dinner from 4pm – 10pm, and stay open an hour later on Fri and Sat. Sundays they’ll serve brunch from 10am – 3pm, appetizers from 3-5pm and a dinner menu from 5-8pm. They will be closed on Monday. Call for reservations at 937.222.3100. And yes, you can still visit them at the 2nd Street Market Thurs- Sat. Mariah Douglas was born and raised in South Bend, Indiana. She is currently a sophomore at the University of Dayton, where she is studying English and Journalism. After her undergraduate studies, she plans to pursue law school and hopefully start her career as a lawyer back in her hometown. Mariah enjoys participating in a variety of sports including basketball, soccer, racquetball, and spinning, just to name a few. She is currently working as an intramural official for UD and staying active in the community through service and local events.